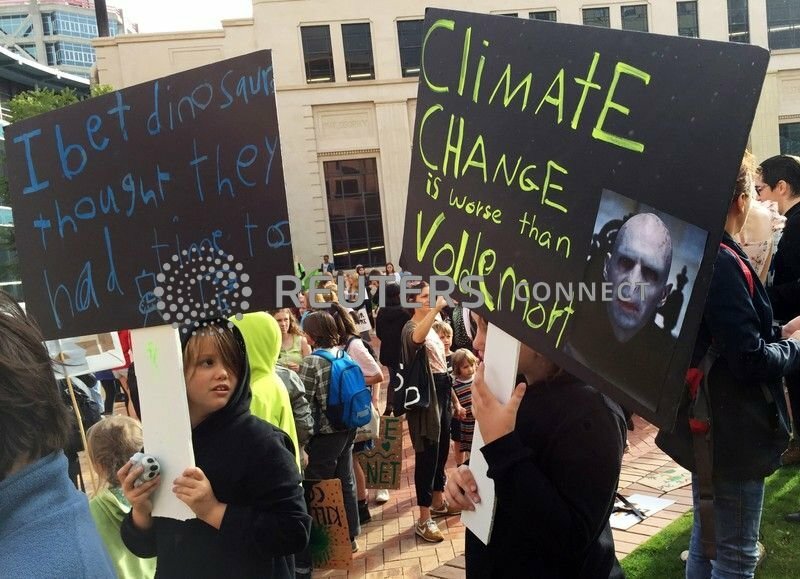 "Climate change is worse than Voldemort," read a handmade sign carried by one student in Wellington, referring to the evil wizard in the hugely popular Harry Potter books and films. In Europe, students packed streets and squares in Paris, Madrid, Rome, Brussels and other cities for "Fridays for Future" protests. Demonstrations also took place across the United States. In Washington, some 1,500 students rallied in front of the Capitol chanting "climate action now!" and waving homemade placards with slogans such as "Our planet, our future." "Education is important but climate change is more important," 14-year-old Molly Powell said. United Nations Secretary-General Antonio Guterres tweeted his support on Friday evening. "Young people can, and do, change the world," he said. "You understand we are in a race for your lives; your commitment & activism makes me confident we will win it." In Düsseldorf, Germany, some 2,000 school children paraded with a carnival float depicting a giant effigy of Thunberg with "Do something about the climate catastrophe at last" written on her raised arms. They stopped around the city, home to the headquarters of many of Germany's largest manufacturers, reading out calls for change. "The clock is ticking and time is against us!" they shouted. "We are the last generation that can fix this." "For action on issues that they think is important, they should do that after school or on weekends," said Dan Tehan, Australia's education minister. Wellington parent Alex, who marched beside his 11-year-old son, disagreed: "It's a much better day of education. This is the greatest issue of our time." This is the generation that can't walk to school, that needs air-con in the classroom, whose only entertainments use electricity and who think we can flood our countries with people from countries already ruined, and survive! But not to worry..... they'll be eating dates and using donkeys for transport. (but not to get to school)! I think, it's increadable, that children think about it and try to save our planet! We have to follow their example! I wonder if you actually know anybody from this generation? Proof that if you lie to people long enough they will start to riot over it. Do you mean that they don't sit on their <deleted> all day playing video games and looking at their phones! Looks like you're the one who's out of touch with trying to bring up a teenager! You go kids!! !the renewal energy is out there without harming the environment I foresee 2 major problems before renewalbles are viable we need better batteries to store the energy and #2 you have to overcome the oil and gas industry a lot of money changing hands and keep in mind a lot of people employed as well good luck I’m hoping you succeed!! If you are really committed to the cause, hold your rally on a Saturday. Many of these young people will have the vote by 2020. Well, it's certainly comforting to see that there are lots of kids out there who care about this extremely important issue although reading the comments from some of the sad old gits on this forum just makes me relived that they are old an thus won't be around much longer. Maybe then we could see real change but, of course, by then it might be too late. Tens﻿ of thousands of school students around the world walked out of classes on Friday in a global strike to protest against government inaction on climate change. Good to see the next generations taking climate change seriously. Alternatively, these kids will grow up and reject the propaganda the anti-capitalist, fascist and elitist "environmentalists" have shoved down their throats. Hopefully that will happen before it is too late to save our hard earned lifestyle.